Eye irritation can appear in many different ways. Whatever your symptom, you want a product that will give you the relief you need. So turn to the eye relief experts - the makers of Visine. Visine revolutionized eye care over 40 years ago by "getting the red out." And today, the Visine brand continues to innovate. 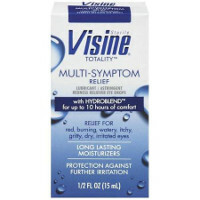 Each Visine product is formulated to relieve your specific eye irritation.